Help with kitchen renovation design? We are thinking about doing a kitchen renovation. Got the contractor, got a "look" picked out, but kind of clueless about the actual design process. Has anyone had a good experience with a designer, either through one of those kitchen renovation one stop shops, or an independent person? We're always a little amazed by how talented designers can look at a situation and see solutions/angles/ideas non-designers might miss. And, sure, hiring one will probably be more expensive. But when you think about how much a kitchen gets used -- and how frustrating a design flaw can be over the years -- it can be worth the extra money. So, got a suggestion for M.? Please share! I'm facing the same issue, but with my bathroom that needs a total teardown and overhaul. I'm going to give Kitchen & Bath World (1980 Central Ave) a try and would welcome input from anyone who has used them. In getting estimates from contractors, it's clear to me that even bigger outfits lack the capability to give comprehensive input on design. You are either on your own, or need to use an actual kitchen/bath design company. That's if you care about anything more than a real generic look where you can go to a big box store to pick out fixtures, tile etc. I, too, am fairly clear about the "look" I want -- classic black & white bathroom with a "cottage" aesthetic suitable for a small 1930s bungalow. I know I want a middle price point (not cheap, but not luxury -- no hot tubs, marble etc), can't have a pedestal sink (I need the storage space of a cabinet sink), want a nice tile job (maybe subway tile), and some fixtures which might help me "age in place" as I get into my 70s and 80s. So I'm not a "blank slate" on what I want in a bathroom, yet I'm still kind of paralyzed on how to go forward with what I do want. So I'll be dropping by Kitchen & Bath World soon to get a sense of what they can do to help me. I can really sympathize with anybody doing a whole kitchen as that is so much more complex than a bathroom. We just completely renovated our kitchen last year. I highly recommend using (or at least talking to) a designer. They can give you so many ideas and help you avoid the pitfall of a novice. I talked to several designers from those who come to my house to those who just look at the floor plan and give the design. Definitely having someone come see the actual space is much better. In my experience, they give a much better design and can make sure the new kitchen will blend well with the rest of the house. That includes a better use of space we have available. Jay Miller of Curtis Lumber did an EXCELLENT job for us. Her recommendation completely changed (for the better) the original plan we had. At the end, we didn't use 100% of her design since I like to put my own touch on it. But, the major idea was hers. The thing to keep in mind when designing a kitchen is workflow. Each individual or family uses the kitchen differently. Think about your workflow in terms of everyday function and social use. How many people cook there at the same time, if your kitchen is also an entertaining or social space, and what your long- and short-term goals are for the kitchen. After you've decided on your wish list, take a good look at what will actually fit. Some things like islands, require a lot of space and just don't work in narrower spaces. Refrigerators can only fit in certain areas, and the kitchen layout's relationship to windows and doors is also a big priority. Friends of mine just redid their kitchen and removed all of the upper cabinets. Itâ€™s amazing how it opened up the space. They added drawers versus cabinets below which made for a better use of space (you can see and get to everything). 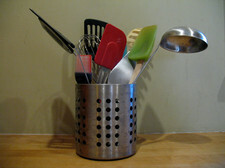 They used HÃ¤fele peg system to keep all of their cookware, dishes and glasses safe and in place. They also put in a pantry with a glass door, LED lights automatically come on when the door is open and turn off when the door is closed. @M : I work for a small, local architecture firm and deal with questions like this on a daily basis. After you solidify 1) your layout, you can focus more on 2) interior design. Depending on your budget / style, a good architect can work-with and introduce you to the appropriate vendors / stores that will help you hone your vision (tile selection, cabinet finish, etc). However, now you'll be armed with a layout that works well for your style + budget and you can make confident, informed decisions! The name of my company is Architex (in Latham). Feel free to contact us 782-7319 (or any other small, residential architecture firm)! It doesn't cost anything to meet with us or talk on the phone, even if our advice ends up leading you in a different direction. We used MKC Kitchens 2 years ago and they were terrific. Pam was really good at putting our vague ideas into a nice plan. They were flexible and made good recommendations on painters, flooring suppliers etc. As someone who has an AAS in Interior Design and has been working in the K&B industry for over ten years (on the operation/technical end btwn designers & contractors), I would suggest a designer who specialized in K&B. You could go to the NKBA site and search for a local designer. The National Kitchen & Bath Association is over 40 yrs old and has designed specs to follow for great, functional design. Both Jay Miller from Curtis in BS and Pam from MKC are members of the local chapter are great people (know them both). Be up front about your budget, have an idea folder of things you like and don't like, make sure you let a designer know how you want to use your space and if you have any special storage needs (large cookware, lots of spice storage, bending issues, etc), but a good designer should interview you and find that out. Other designers I know, but not all of them: Nancy Moore with Millbrook in CP and Larry Miller Designs. GREAT contractor: Jim Macrina / BarMac Construction. I have not heard anything bad out of K&B World, just don't know any of them personally. Good luck! I design and build a lot of kitchens in my apartments and get to try out lots of ideas, but when I finally redid my own Kitchen I knew I wanted some design help. When spending that amount of money I wanted to make sure I didn't screw anything up! I worked with Stacy Snell with Design on 20 and she provided very valuable input, and tracked down things for me that had the look I wanted. What I liked about this setup was that I did not have to order my cabinets, counters,etc through her and could use who I wanted. i paid for her time, which was well worth it, And if she brought something to the table I bought it through her. We met with MKC and several others mentioned already.We thought MKC offered a lot--they were helpful and patient, too. We ended up going a different route, but we really liked MKC.